While Spock is still MIA, it’s hard to care when so many beloved season 1 characters have returned for another action-packed and exciting episode. After a slightly more lowkey episode last week, Star Trek Discovery season 2 is back to its usual action-packed antics with episode 5, Saints of Imperfection, which sees the crew attempt to rescue Tilly (Mary Wiseman) as more than a few familiar faces from the past pop up. It’s not all about the action though as the episode brings more than a few feels and surprises along the way too, but whether it’s making us gasp or cry, episode 5 is another incredibly strong episode from a show which can seemingly do no - or at least, very little - wrong. With some story spoilers from this point on, here’s our verdict on Star Trek Discovery season 2, episode 5. The last time we were aboard the Discovery, Tilly had apparently been eaten by the mycelia virus, AKA May (Bahia Watson), and we rejoin the crew as Burnham (Sonequa Martin-Green) tries to come to terms with the news, as well as continuing the search for her brother Spock. As fans have probably guessed, Tilly isn’t dead, but has been taken into the mycelia network by May who wants her help to defeat a monster that’s killing her species. Season 2 has all gone very Stranger Things as Tilly awakens in Star Trek Discovery’s own version of the Upside Down, but not one for wasting time, the series thankfully doesn’t make her linger there long before her crew come up with a plan to save her. Have you seen this Vulcan? Before they can get that far though, Discovery finally catches up with Spock’s shuttle and after continued ignored hails and a short pursuit in which they capture his ship, we’re finally ready to come face-to-face with the latest iteration of the iconic Trek character. Except we don’t. Yes, once again Spock is a no-show in a series, which is seemingly always talking about him but not to him, and it’s getting tiring. At this point, it feels like every episode is rushing to get the ‘no Spock today’ element of its story out of the way so it can move onto other things, when it would’ve just been better to have not put such an emphasis on his character until he was ready to be presented to the audience. Instead, Georgiou (Michelle Yeoh) is aboard his shuttle and just like that the Emperor, Tyler (Shazad Latif), and Section 31 collide with Discovery in oh-so-many interesting ways. I’ve said it before and I’ll say it again, any scene involving the Terran Emperor is the best thing on TV right now and this episode is no exception as Pike (Anson Mount) struggles to wrap his head around this version of Georgiou who’s a little bit different to the one he remembers from his Academy says. Burnham is immediately on her guard, for obvious reasons, and the private exchanges between the pair are laced with an incredibly watchable tension that’ll make you demand to see more. Burnham is so consumed with Georgiou and the threat she poses to her brother that she’s completely blindsided by the arrival of Tyler who’s joined Section 31 since we last saw him. 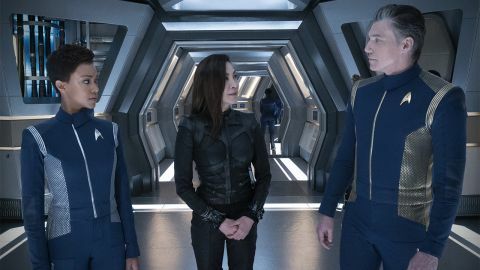 We - and the crew - are barely given the chance to digest his re-appearance before Burnham and Stamets (Anthony Rapp) dive into the mycelial network to try and save Tilly, but it’s clear there’s a lot to unpack when it comes to this ever fascinating character and Discovery isn’t looking to rush it. In the mycelial Upside Down, May explains how the monster that’s destroying her world arrived after Stamets opened the door to the network and that it chases the Discovery (killing as it goes) every time it briefly appears in the network. When the Discovery appears in the mycelia network to save Tilly, the truth about the monster is eventually revealed and while it’s a little far-fetched even for a sci-fi show, the science of the story more or less makes sense. I won’t go into any more detail about what this storyline entails because it’s a HUGE spoiler, but it’s an incredible emotional turn of events, which will have fans in tears (both happy and sad). At this point, it goes without saying that the cast’s performances throughout are superb, but it’s a particular joy to see more of Yeoh’s Georgiou and I’m so glad that the show found a way to keep her a part of season 2’s story. And Section 31’s Captain Leland (Alan van Sprang) also puts in more of an appearance in episode 5 with promises of further adventures with the Discovery. The mycelial network finale brings the high stake action to this episode proving once again that Discovery is better than any other Trek show at incorporating blockbuster-style action sequences into its stories. The whole episode is a rollercoaster of emotional revelations with the only slightly dud moment coming from the lack of Spock (again). Basically, you’ll need a bit of a lie down after watching Saints of Imperfection, but it’s definitely worth it. Find out about the other new TV shows coming this year that you definitely don't want to miss.